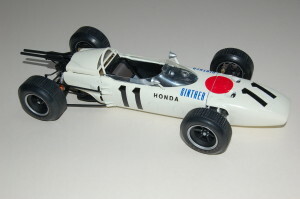 Well publicised first win for Honda in Formula One came with Richie Ginther in the RA272 in 1965, the car with the transverse V12 1.5 litre engine. This first victory was in Mexico City at high altitude and was the last of the 1.5 litre formula. The car driven by Americans Ronnie Bucknum and Richie Ginther in 1965 contested a total of eight Grands Prix that year, Ginther winning in Mexico and Bucknum’s best placing also at Mexico, placing fifth. Otherwise only two sixth places were achieved and the car remains an interesting engineering approach to maintaining some degree of competitiveness in the 1.5 litre equivalency, when considering both its extreme multi-cylinder and transverse application. The engine was supported in a tubular frame making this a semi-monocoque car. The car appeared famously at the Goodwood Festival of Speed in 2004. This model, is not my own, but Tamiya’s 1995 diecast RA272 in 1/12 and because it is a ‘must’ and I was fortunate to be able to obtain one, I have included it here merely for completeness, rather than for detailed discussion. The model is good, but lacks fine detail in some areas of the rear drive train in particular. The engine and removable engine cover are excellent, as is the cockpit and overall appearance. It is a shame the nosecone appears slightly loose but is not detachable. It is features such as this that have inspired some to have considered taking it apart and re-buildling certain aspects of it. Unless done very well, this may be a disappointing mistake. My purpose for owning it, is simply because it exists and also because it would sit well with a RA273 and RA300 following on, therefore enjoying the evolution of an important marque. Hello Mark! Pleasure to read your review of Tamiya model 23201 (Honda RA272 1:12 diecast), especially as I purchased the same model yesterday (now in transit from the U.S). Could kind consideration please be given to advising whether your purchase included a screwdriver (to affix / remove the engine cowling and side panels aft of cockpit) and/or other ancillary items in addition to the three bodywork items previously mentioned? With advance thanks! Sincerely, Nick, London. Thanks for your e-mail re this splendid diecast. I feel it’s very likely that a simple cross-thread screw-driver was included, for Tamiya would want the purchaser to enjoy their product immediately, fully and straightforwardly. I would have to go into the loft and check the empty box to be sure. My intention when purchasing this model was to display it alongside an RA273 and then I later decided to start planning to build the RA300 from scratch, which I am currently about 1/3 through. I will have to return to an unmade kit to complete the trio, for my first RA273 has given rise to a few parts incorporated in the RA300, including the wheels/tyres, yet to be converted from Goodyear to Firestone. To see this build as the project unfolds, see my Twitter output, easily accessible from the icon on the RHS of the interactive menu bar. I may be taking this work-in-progress along with five or more completed models to the Automodellismo show in Hanslope, near Milton Keynes May 5th in a couple of weeks time.